An amazing new space has opened just off the Holloway road. Jenius Social is the brainchild of Jennifer Yong and I was privileged to be invited along to a bloggers and press evening for a taste of what she’s created. 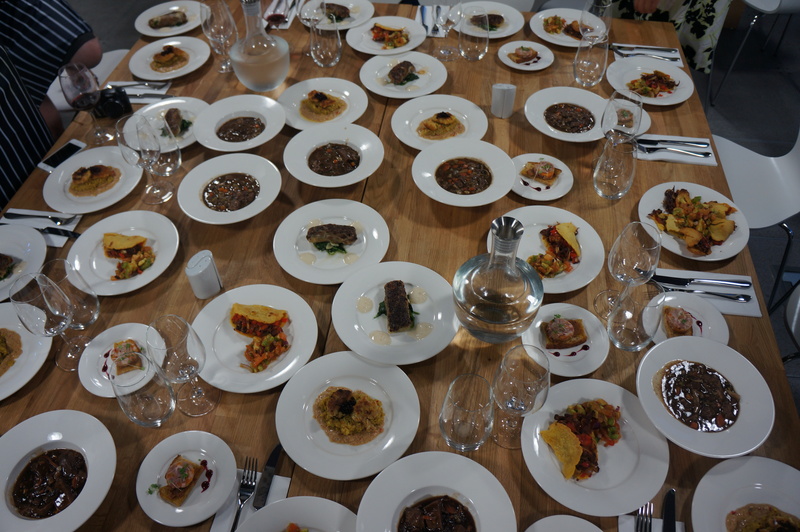 Being a lover of offal and of the belief that if you’re going to eat an animal you should eat every bit of it, the nose-to-tail tapas cookery class was right up my street. I arrived in to a bright, vibrant space with ceiling to floor shelves along one wall stacked high with wines, oils, pasta, craft beer and preserves for people to pop in and buy. The “white and oak” furniture is all moveable, even the kitchens and hobs can be pushed back to make way for functions or to create different environments according to what the space is being used for. A blackboarded wall announced that we weren’t alone for the evening and guests began to arrive for a cheese tasting class in the main room. After a lot of ‘ooing’, ‘ahhhing’ and ‘ouch!ing’ we were taken to our work stations to pair up and cook the dishes with out hands held and lot of laughter. Nobody seemed precious about what they did until it came to the chopping of the testicles (we all wanted a photo of us ‘chopping’ so that we could show our partners). Once we’d dished up with a presentation that would impress Marcus Wareing, we were taken back in to the main room to enjoy the fruits of our labour. The testicles seemed to be the ‘firm’ favourite – tender, delicate in flavour complimented greatly by the satay style sauce. I was surprised to by the ox tongue – something I hadn’t tried before but will definitely be making again. The evening ended with much enthusiasm for the place, the food and the new friends that we’d made. I would thoroughly recommend that you give Jenius Social a go – whether it’s for a hen do, a cocktail dating night (yes they run them as well!) or for something different to do with friends, clients or colleagues A great space, great food, great fun and to top it all off you actually learn some stuff.